Since having formed a punk quartet (Chicago’s Verbӧten, featuring Dave Grohl’s cousin Tracey Bradford on vocals) as a precocious 10-year-old, multi-instrumentalist Jason Narducy has kept busy with other bands (most notably Verbow) and as an in-demand sideman with the likes of Bob Mould, Superchunk and Robert Pollard. He’s also releasing his first solo record under the Split Single moniker, Fragmented World (Inside Outside). We talked to Narducy about rocking as a youngster, his famous Split Single bandmates and the unlikely influence of Michael Jordan. Narducy will also be guest editing magnetmagazine.com all week. 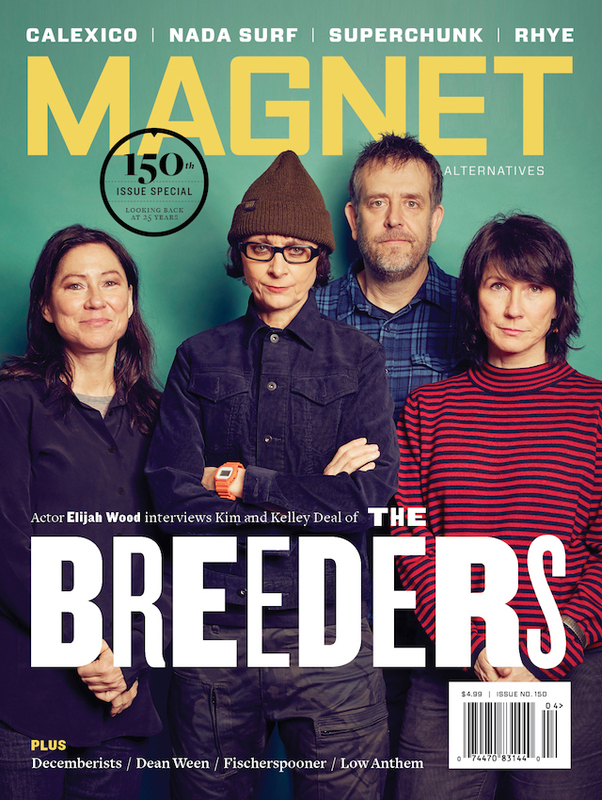 MAGNET: You began playing an instrument early on. What do you think sparked your interest? Narducy: I grew up with my parents playing the Beatles and the Stones and the Kinks. I immediately took to rock music. I remember when I was probably five years old, I got a Mickey Mouse drum kit from my parents and grabbed two cousins and made a band. I said, “You’re doing this, you’re doing this.” I wrote a song called “Wolf Man,” which was to the tune of “I’m Eighteen” by Alice Cooper. I loved werewolf movies, so that was the combination of things. And then my stepdad in ’76 or so co-founded a bluegrass band called the Special Consensus, which still exists though he’s not it anymore. So I would go see the Special Consensus at FitzGerald’s in Berwyn (Ill.). I specifically remember that. That’s 35 years ago. Yes, but not yet. [Laughs] I remember seeing the Special Consensus and then my stepdad bought me this little mandolin, which I promptly put a Star Wars sticker on to make it cool. I learned mandolin first, and I would jam with him. My mom played piano, so the three of us would play music together. Then in ’79, when I was eight, my dad took me to see The Kids Are Alright on a Sunday. We were in line to get tickets, and there were two elderly women in front of us. The ticket-seller guy was yelling through the glass, “You don’t want to see this movie! It’s loud! It’s too loud!” Something in me was like, “Ooh, what’s going to happen here?” To this day, I get goose bumps watching that movie … just the opening with the Smothers Brothers and smashing the instruments. I had never seen anything like that, and that was it. I drew pictures of the Who for about a year and would constantly have air-guitar concerts with any kind of toy. When I was nine, my mom and stepdad gave me an electric guitar, and a year later, I had Verbӧten. What was it like being a 10-year-old kid and playing in a band in clubs? So Verbӧten only lasted a couple of years? What did you do musically from that point till Verbow? I stopped playing music for a bit. I didn’t play guitar routinely until high school. I started a band when I was a freshman. From age 12 to 15, I wasn’t playing very much. I had to shake the rust off. I had some bands where I wrote some songs but not much else to speak of. We did some four-track demoing but nothing else. I was in a bunch of bands in college in Baltimore and here in Chicago, but it wasn’t until I stared playing with Alison (Chesley) in ’93 that things started again. When did it go from you being a fan of Bob Mould to him producing the first Verbow record (1997’s Chronicles)? In ’91-’92, I would go to as many shows of his that I could. I’d go to soundcheck, and I’d bring him local press. Back then, there wasn’t the internet; he’d do the interviews, but he wouldn’t know what happened with them. So I’d bring a stack and hand it to him. He’d appreciate it and we’d talk. I never told him I was a musician, never gave him a demo tape. I had a friend whose dad knew a guy named Al Teller, who was running MCA Records. His dad said to me, “When you want Al to hear your music, I’ll do it, but don’t do it before you’re ready.” That rang a bell with me. I looked at the band I had and thought, “We’re not ready.” I felt the same way with Bob. When I started playing with Alison (as Jason & Alison), I was ready for him to hear it, but I don’t think I gave it to him because Jam Productions proposed to Bob that Alison and I open up three of his acoustic shows. Jam called him and told him about us opening and he said, “Tell me about this Jason & Alison thing,” and they told him that I’d booked a show at Beat Kitchen (in Chicago) where I played Workbook all the way through. When I walked into soundcheck, he just laughed: “Welcome. You would’ve been here anyway, you might as well play the show.” After we soundchecked, he asked us to do the rest of the tour. Then after the tour, he asked to produce the record. We didn’t have a label, we didn’t have a publishing deal, we didn’t have anything. We were free agents. He said, “Come to Austin, and we’ll make this thing.” We made Chronicles in six, seven days, and he sent the tapes to labels and sort of protected us: “This guy’s no good, don’t talk to him.” He paid for the whole recording and everything. What did you do after Verbow ended? I started a band called Rockets Over Sweden, which put out a self-released EP. We maybe played six shows or something. My painting company started doing well. We bought a house. My wife and I had a son. I sort of stopped music again. I was playing in fun cover bands just to drink some beer and play the Who, but it wasn’t until 2005, when Bob asked me to play bass in his band, that I got back into it. So that’s all it took, him asking? Yeah. But then I thought about it … I was a basketball player in high school, and I went to Doug Collins’ basketball camp, and Michael Jordan came to the camp to talk to us. He wasn’t there for very long, but the things he said really resonated with me. He said, “Never walk into a gym and just dribble and shoot and jog over and pick up the ball. You never do that in a game, so you’re practicing something you don’t do. Go into a gym and play at full speed.” He’s like, “People stand at the free-throw line and shoot 100 free throws. You never do that in a game. Shoot two free throws, run around the gym, come back and shoot two more.” I knew that I was not up to speed to play bass in the Bob Mould Band. So I thought of that and went to my garage and set up a full PA system facing me, with a mic and bass amps behind me, and I cranked Bob Mould coming at me at full volume all summer. Instead of sitting down and listening to tunes with headphones, I practiced like it was a show. That really got me ready. You playing with Mould is how Tommy Keene saw you and asked you to play in Bob Pollard’s band in 2006, right? Yeah, and Jon Wurster. They were both in the Pollard band, but no one else had been picked. They both saw me at different times: Wurster in North Carolina and Tommy in D.C. The last show of that tour was in L.A., Tommy was there, and that’s when he asked me. I couldn’t believe it. The last show of the tour and you want me to start up with another songwriter I love? It was pretty amazing. How did Wurster join the Mould band? In ’08, we were about to head out and (drummer) Brendan (Canty) and his wife were going to have their fourth kid. He was like, “I can’t do this.” Bob tried another drummer, and it wasn’t working out. We asked Jon first, but he had a Mountain Goats tour at the time. But we were two, three weeks in, and we were like, “Where are you now?” Two days later, he flew to L.A. and we started playing. We didn’t even rehearse. What’s it like playing with Mould, a guy you basically idolized? Bob is this unique person where he’s still impressive. He’s an incredibly hard-working guy. He’s a genius. You maintain that respect and reverence for him because he’s so intelligent. There are times where I’ll ask him a question about some city that we’re in, and he knows the main source of manufacturing income. He just knows these things. He’s also just a really good bandmate. He defers to Jon and I on a surprising amount of things. It’s his band and it’s his call, but there’s a nice interplay. He likes our feedback, and it feels good to be a part of that. We would gladly do it without that. 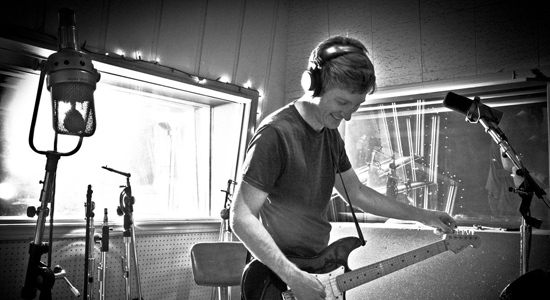 What has the Superchunk experience been like for you? I was honestly hesitant about that because Laura (Ballance) is so iconic. I envisioned walking onstage and having vegetables thrown at me. [Laughs] So many guys have crushes on her and out I come … I was like, “This could be such a mistake.” But she really did an amazing job reaching out to the fans first with that letter and introducing me. It couldn’t have gone better. She’s still in the band, so I know I’m just the touring guy. It’s been super-comfortable—no pun intended. I enjoy the challenge of learning that many songs that quickly. Mac (McCaughan) changes the setlist every night. I’m not exaggerating when I say that probably every soundcheck, I’m learning two to five songs right there. That’s invigorating for me. I like that challenge, and it’s gone well so far. So you’ve been doing all the sideman stuff and went a long time without writing anything—eight years, I think you said on Twitter. So what happened to spark this period of activity with Split Single? At the end of 2011, (Dolly Varden’s) Steve Dawson asked me to (open) a show. I wanted to challenge myself: What if I wrote 10 new songs and played those songs at the show? I could fall flat on my face or it might go OK. Either way, I’ll feel good about having pushed forward instead of getting up there and playing some Verbow songs or Jason & Alison or whatever. Do you think if you hadn’t been asked, this LP may not have happened? Maybe not. I definitely needed that deadline. Those are always healthy. Looking back, though, the first two weeks of January, I was recording (Mould’s) Silver Age and that show was January 28, and I was asked in December and there were the holidays … I’m not sure how I did that. Three of those songs ended up on (Fragmented World). That’s really how it got going, that challenge to myself and the question from a friend to do a show. I really like the record, and I’m glad I really like it because I didn’t want to have to sit here and pretend I did. [Laughs] Oh, cool. I’m glad you do, though. Probably the back end more, with all of the power-pop stuff. Well, I’ll get to that. How do you feel about how the record turned out? I’m excited. I enjoyed this process more than any other time in my life. When you’re younger and you’re writing songs and you have a label, you put pressure on yourself. I put pressure on myself that was completely unwarranted, feeling like I had to write this super-important record. You get older and you realize there are going to be people who like it and there’s going to be way more people who don’t like it. Always. For every band. Once you know that, it’s sort of freeing. I really enjoyed the songwriting process, and I really enjoyed recording with (Wurster and Spoon’s Britt Daniel on bass) and interacting. “Never Look Back” is my favorite. It’s one of those songs that, depending on how much attention this record gets, is going to be on year-end best-of lists and CD mixes. I don’t know if people still do that, but it’s going to be on them if so. I was wondering, after you write a song like that, do you know at the time that you nailed it? I’ve been writing songs long enough to not feel like I have any control over that sort of thing. On the second Verbow record (2000’s White Out), at the last minute I tacked on a demo for the very last song. It’s Alison and I playing a song I just wrote, acoustic. And that’s by far everybody’s favorite song. I don’t know—it felt good when I wrote “Never Look Back.” It was definitely one of the best songs I wrote in that first batch. I felt like it was strong enough to play for people. But I ended up not opening the record with it. There’s been some press about how Split Single is this “indie-rock supergroup.” There seems to be some confusion, like you three called each other up and said, “Let’s form a band,” and you wrote all these songs together. Does that matter to you at all? And then it came up the same way again recently. Yeah, it did. I knew it would happen. My publicist was like, “They’re going to lead with the Britt Daniel thing because they love Britt Daniel.” And it’s like, and I love Britt Daniel. It’s just how the press works. I don’t mind that. Britt’s totally behind this thing and is excited about it. Both he and Jon were a huge part of making the record. Is it a little bit skewed? Yeah, but if you read further, it’s like, “Jason’s going to be playing shows with other people because Britt and Jon aren’t available.” It’s a solo project. That’s why I ask. It’s your project, and it’s special to you. You’re not just the session man. This is your stuff, and it’s great that it’s getting attention, but people are getting the story wrong. Yeah, it’s important to stress that because I don’t want anybody buying tickets to a Split Single show expecting to see Jon or Britt. That part’s important. But I think so many musicians have side projects now that it doesn’t really matter. I’m not offended. Why is Fragmented World self-released? I sent it to labels, and they said no. I mean, I sent it to a select few. [Laughs] I didn’t send it to everybody. I wasn’t offended by that, either. I’m 43 years old. I’m not going to get in a van and play every single club in the U.S. Labels are a risky endeavor these days. People don’t buy records. I think maybe some of them didn’t know my full story and maybe if they had … I don’t know. I’m glad it’s working out this way. I’m self-releasing, and I have distribution. I have a company administering the songs. I have a publicist. We’re going to try this out, just doing it out of the basement. It’s kind of exciting for me. There’s a lot of work that comes with it, but so many bands do that these days, and it’s a lot easier than it used to be. We’re going to try it out this way. So you’re just going to wait and see as far as doing another record? I don’t even know. I have a whole new Bob Mould record and tour cycle coming up. I’ve got Split Single shows. I can’t think two years ahead quite yet. We’ll see if anybody likes this record. [Laughs] Besides you.